YOYO FOR PLANTS There are 2 products. Find ingenious tutors yoyo for plants. They are used in horticulture for hanging plants anywhere you need. They are available to the unit or by batch, depending on your needs. Ideal for the trellising, the yo-yos are very easily adjustable. You can adjust to infinity, as the plant grows. 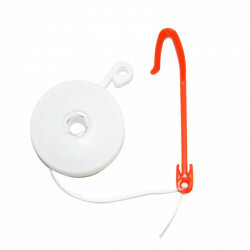 The yoyo will help support you plants properly, so that the branches do not break under the weight of flowers or fruit.